With Update 4.0: Maelstrom going live tomorrow, his mission is still intact, and Trion Worlds still trying to please North American fans of ArcheAge by reducing the RNG in the game. Results have been mixed. According to SteamCharts, the game got a bump when 3.5 hit in June but has slipped back down since. Can Maelstrom’s new gameplay and more player-friendly mechanics help revitalize it? That’s what I was trying to find out when I chatted with the ArcheAge team a few weeks ago. Kwai couldn’t make it, but I did have Producers Amanda Fry and Seraphina “Celestrata” Brennan on the line, and they told me a little bit about the new content and a lot about the work Trion, and even XLGames, are doing to make the game more palatable to RNG-loathing gamers. The expansion combines parts of different Korean updates, with the big “set piece” in the expansion being Bloodsalt Bay. It’s a four-team, 5v5v5v5 naval PvP arena with sea monsters and a giant whirlpool in the middle, and if all that doesn’t sound cool, then nothing will satisfy you. I don’t play ArcheAge, and likely never will, but just the brief snippets I saw of Bloodsalt Bay during my interview looked awesome. Actual players should dig it. Each randomly assigned team uses one of four premade ships, so ship navigation and combat, not individual character skills and abilities, rule the seas. Brennan ran off the various tasks players will have to perform during battle: “using cannons, dropping the anchor, raising the masts, going up to the crow’s nest, firing harpoons,” and also repairing damage to your ship. You’ll have to work together as a team, dealing with rough currents and rescuing ghosts that were captured by the goddess of the sea. If your ship is sunk, you’ll respawn, but all the ghosts you’ve collected will be cast adrift. The team that rescues the most souls after 12 minutes wins. Moving on to the quality-of-life changes, Brennan said that several of the game’s ideas “were in a bit of a need of a refresh. The community’s made a lot of various suggestions, and Maelstrom delivers on a whole bunch of them.” There’s a new raid finder bulletin board and a raid alliance system, making it easier to find and build big teams to take on ArcheAge’s toughest challenges. “It moves a lot of the stuff you used to do in chat all the way over to an actual in-game UI system,” said Brennan. When you’re trying to organize 100 players to fight a giant open-world boss, every little bit helps. With the raid alliance finder, all raids also get full credit for the boss kill. Housing addicts will love the new European-style Nuian mansion, and if you simply must have that east-facing window to let in the morning sun, you can now rotate your house. “It sounds so funny, but it’s a big deal,” said Fry. Previously, the only way to enact such a change was to completely destroy your house and rebuild it. That might make more sense, from a realism standpoint, but … the game has dragons and sea monsters? So [bleep] realism. The “big one,” as Brennan put it, though, is the long-awaited change to the lunagem system. You’ll be able to get the stats you want from a lunagem and, when you slot it into a piece of armor, it will work automatically, with no chance of a failure and the loss of all your precious gems. Yay, less painful RNG! Naturally, it’s not all gemstones and sunshine. It takes a little more effort to get lunagems now … but did we mention, no RNG? Also, old lunagems still work the old way, but, in another difference between the Korean and Western versions of the game, players can still salvage or slot them as they wish, risks and all; in Korea, players were forced to salvage them. You can get low-end lunagems in the honor shop, along with charms. “This is the first time charms have been purchaseable with in-game currency,” said Brennan. Another new currency, Kyrios badges, can be earned in arenas, and are “focused on PvP upgrades,” while some older currencies are being rolled into honor or Gilda stars. If you do want to spend money, though, Trion Worlds is happy to oblige. There are three levels of Maelstrom packs you can purchase, costing $50 to $150, with the largest pack including a dragon mount. A dragon! Before we ended things, I brought up Kwai’s comments from the last interview and some of what was said in the recent developer’s letter regarding Trion Worlds’ connection with XLGames. Brennan wrote that letter and told me that “We are making strides and showing XLGames what works for our region.” She brought up the example of other regions requiring skill books to unlock ancestral skills, something Trion vetoed for North America. “Adding another hurdle to that would be hurtful to players,” she said. Other changes that Trion Worlds has pushed back against include paying gold to post on the raid finder, increases in the number of items required to craft basic components, and increased labor costs on packs. 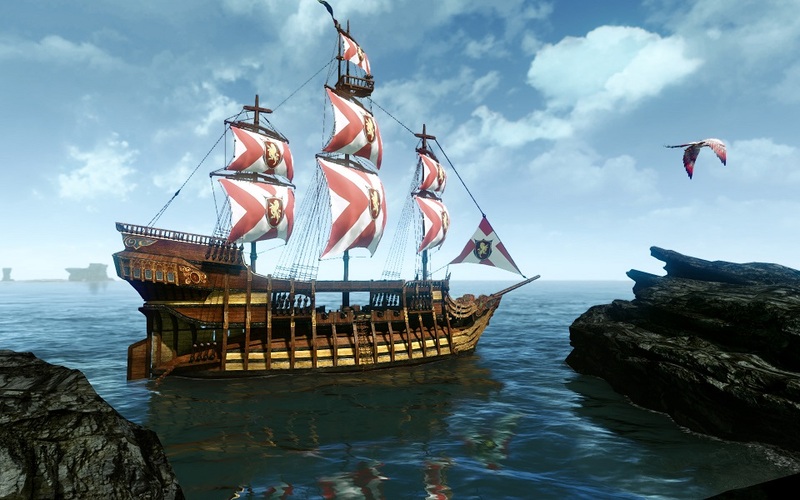 ArcheAge may not be for everyone, but those who have stuck with it through the years should be happy with the changes Trion Worlds is enacting. Will it bring back those who gave up on the game’s heavy RNG focus? That remains to be seen, but Maelstrom should at least be a step in the right direction.